The classic rock band Styx have been creating exciting new music for over four decades and they are preparing to release their 16th album, "The Mission" on June 16. 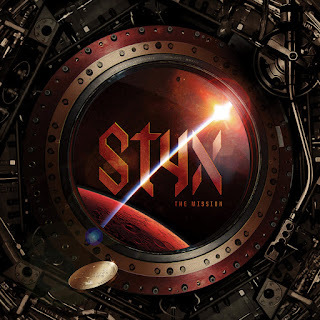 It has been 12 years since their last studio album and in that time, they have toured the world numerous times, absorbing what the fans are looking for with new Styx music and they certainly deliver it on "The Mission." The album begins with the signature Styx "Overture" that will certainly get the listener excited for what's to come. Tommy Shaw's guitar comes out blazing for the intense, pick-up of "Gone, Gone, Gone" as you prepare to blast off with that classic Styx harmonies. The concept of the album is space travel with songs like "One Million Miles" and "The Red Storm" you get swept up in the outstanding musicianship that Styx deliver in every piece of music they produce. If this album feels like a nostalgic trip, then you won't want to get off the ride, as songs like "Locomotive" and "The Outpost" are some of the best the band has written in decades. They finish their new album with the piano piece "Khedive" and the up-tempo swing of "Mission To Mars" to close out your journey. Styx will be kicking off their U.S. tour on June 9th in Lincoln, NE and runs all summer long into September. For a complete list of shows and to find out more about their new album "The Mission," please visit styxworld.com.